Looking for the very best Margarita recipe? Look no further, my friend! When we head out to a restaurant, I am typically a ‘white wine please' gal. That being said, our favorite Mexican restaurants are the ones whose Margarita recipes have passed THE test. Suffice it to say that our favorite Mexican restaurants are those that have the best Mexican restaurant margarita recipes! I can honestly say, without hesitation, that my dad makes THE BEST MARGARITA! Hands down! No Question! After you give it a try, you'll be convinced – as I am – that this is the perfect margarita recipe! Not that I want to make you feel insecure about our national security, but I'm convinced he honed his bar-tending skills during his 26 years in the US Navy. My dad was a submariner, so after 6 months underwater they were always ready for a party when they came back home. It's because of my dad and his oh-so perfect margarita recipe that I consider myself a bit of a margarita snob. I can't just order a margarita in a restaurant without interrogating the server about the specific ingredients in their margarita recipe. And with Cinco de Mayo coming soon, you will be the go-to bartender with this perfect Margarita recipe! But, do yourself a favor and don't limit yourself to just having this delicious libation once a year for your Cinco de Mayo margarita. Once you've tasted the clean, brisk and simple flavor of this drink, you'll be spoiled too. 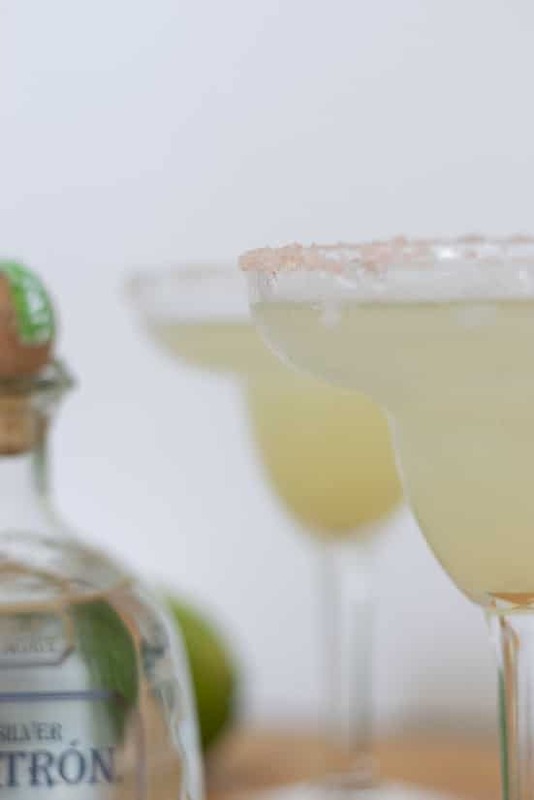 In my humble, yet educated (through years of Margarita tastings) opinion…the very best Margarita recipe has 4 very simple ingredients…Good Tequila, Fresh Lime Juice, Simple Syrup and just a splash of Triple Sec or Cointreau. Oh, and of course you need legit Margarita glasses! I have 2 boxes of these which are perfect for entertaining larger crowds. Let's talk Tequila a minute…while there are variations within the two types of Tequila, generally they fall into the Silver or Gold category. The Silver, which is the clear, colorless tequila is usually cleaner and crisper tequila while the Golds tend to have more of a caramel, earthy tone given that they are aged in barrels. I'm a Silver gal, but that's just a personal preference; use the tequila of your choice. And while it definitely takes a bit more time, freshly squeezed limes are the way to go. Depending on your lime, you can get close to 2 ounces out of a large one. I use an electric citrus juicer. If you just don't have time to juice your own, use RealLime as opposed to limeade. N&N Tip: Microwave your limes for 20 seconds and then roll them on the counter to help get the juices flowing! A fresh and crisp Margarita...just sweet enough but not too sweet. If you like your rim salted, run a little lime around the edge of your glass and in salt. If you like your Margarita on the rocks: put ice in your glass, mix all ingredients in a cocktail shaker and pour over the ice. Top with a slice of lime. If you like your Margarita chilled but not over ice in your glass: add all ingredients to cocktail shaker, fill with ice, shake for 10-20 seconds and then strain into your glass. Top with a slice of lime. Easily multiplied for larger batches. Pin for your Cinco de Mayo planning! Or…just because you want THE VERY BEST MARGARITA RECIPE! And if you are looking for some additional cocktail recipes, look no further! Thanks again for spending a few minutes of your busy day with me today and hope you have time to enjoy this Margarita Recipe. 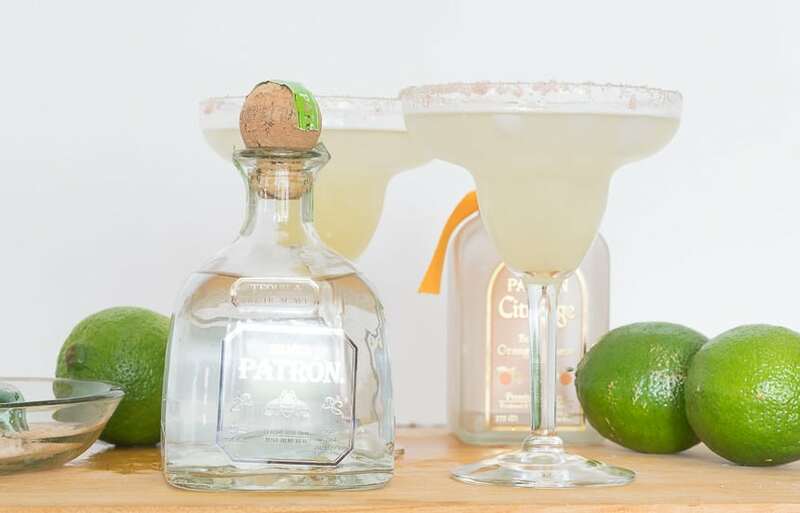 For Cinco de Mayo or anytime, this is the perfect margarita recipe. OK…now I think I have a problem. It is 8:30 in the morning and I am suddenly craving a margarita! Perhaps I should wait till later. 🙂 I love a good margarita and can’t wait to give this recipe a try. Thank you for the great roundup of recipes and for sharing my rice recipe! Wow, what a line up you have here Lynn (thanks for including my carnitas recipe) and those margaritas are calling my name! They are begging for hot summer evenings on the patio with good friends and lots of laughter! Andale! Hey Jane, you are so welcome…thanks for a great looking recipe. We are ready for those patio dinners as well…seems winter decided to make one last visit here in Southeastern NC. I’m looking forward to making those carnitas…they have been on my to-do list for some time. This sounds amazing, I love a good margarita but have never had luck making a decent one at home. I am definitely trying your recipe, maybe for Cinco de Mayo! Recipes look amazing! Will have to try the Margarita and Fish Tacos soon! Hi Cynthia and so sorry that I am just seeing this. Hope your Cinco de Mayo was delicious and that you enjoyed Dad’s Margaritas! It’s 7 am in the morning and just thinking about those margaritas is making my mouth water…not a good way to start the day! Thanks again for swinging by and leaving your kind comment. Already pinned and def planning on making this margarita recipe Friday! Enjoy Tara! I know I’ll be throwing one back on Friday as well! Happy Cinco de Mayo!